"We have viewed this project as a transformational one for the Niagara Falls area. I am very glad we are able to break ground today and start construction. This is a testament not only to Hamister Group's commitment to the Western New York community, but to our local, regional and state partners throughout this entire process," Chairman Mark E. Hamister said. The $35 million project calls for a six-story, 128-room Hyatt Place Hotel and will also include 14,500 square feet of meeting and banquet space (including outdoor patio) on the top floor and 7,000 square feet of retail space facing Old Falls Street. Goldman Sachs is providing financing for the project. 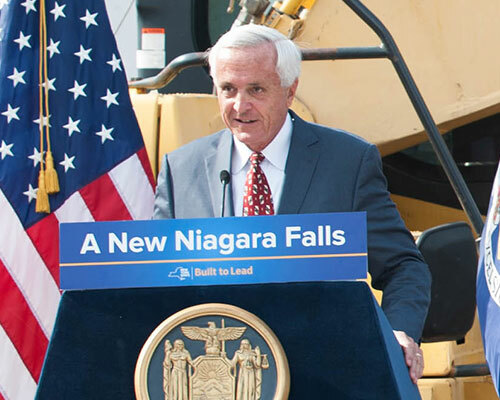 "I am also grateful to Empire State Development, especially Sam Hoyt and Chris Schoepflin and Niagara Falls Mayor Paul Dyster and city officials for hanging in there with us," Hamister said. "They demonstrated a great deal of courage and fortitude when the doubters were calling for the abandonment of this endeavor." 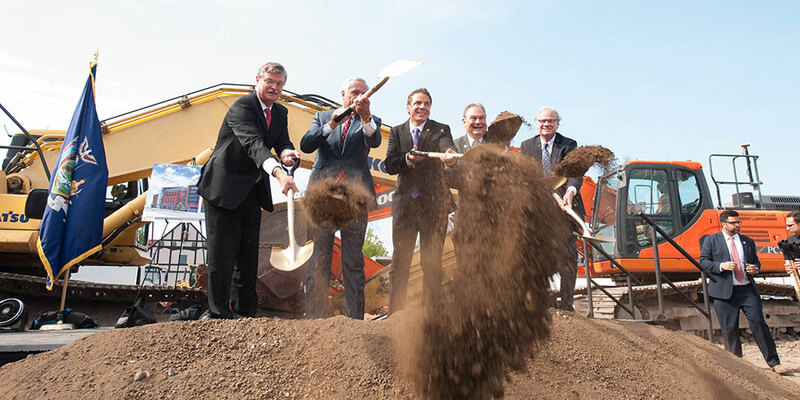 Niagara Falls Mayor Paul Dyster; Hamister Group, LLC Chairman and CEO Mark E. Hamister; New York Governor Andrew Cuomo; New York State Assemblyman John Ceretto; and Empire State Development President & CEO Howard Zemksy break ground at 310 Rainbow Boulevard on July 12. Construction is anticipated to take 15 months. R&P Oak Hill Development, LLC is the General Contractor for the Hyatt Place hotel project. Hamister Group's last development – 10 Lafayette, formerly known as the Tishman Building – was completed in 2014. The $42 million development serves as Hamister Group LLC's corporate headquarters; has 18 loft-style apartments; and is the home of a new 124-room Hilton Garden Inn. Hamister Group is a national healthcare and hospitality management organization located in Buffalo, NY.